My mother is health-concious-oil-free-salad crazy, our food habits hence – poles apart. She indulges in early weekend morning walks, yoga and meditation, loves nothing more than fruit for breakfast salad for lunch and no dinner. Whereas i indulge in late weekend mornings, sweet for breakfast, indian for lunch and mostly continental for dinner (Opposites). 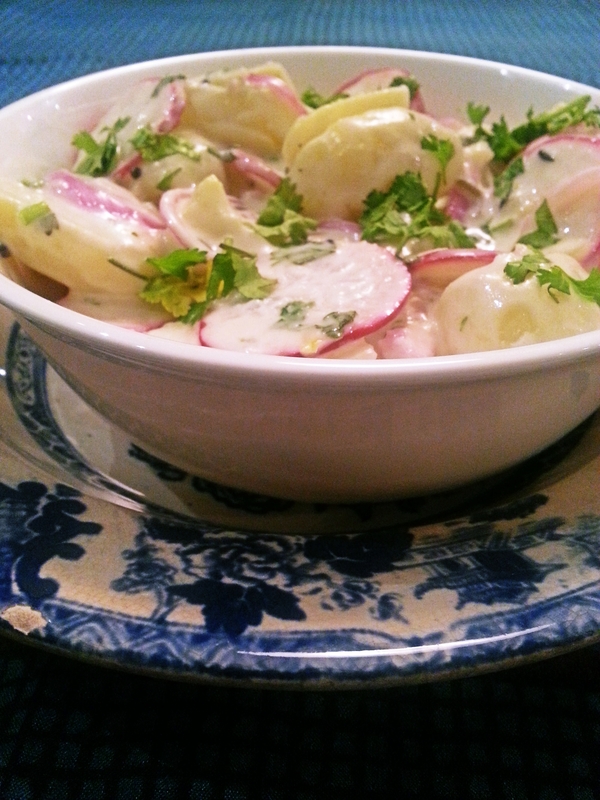 But this salad has such a lovely flavour i can have bowls full, it is immensely moorish and so fresh and satisfying. The radishes add such lovely colour and texture to this salad . Since i still get scolded for my eating habits this salad was perfect to impress my mom. Made a lovely meal for my mom and a healthy starter for me. In a bowl whisk together the mayonnaise, greek yogurt, lemon juice,crushed garlic, chopped coriander, chopped green chillies and half the oil. Heat the remaining oil in a small pan add the cumin and mustard seeds as soon as they pop add them to the dressing and stir. Add the potatoes and finely sliced onions to the dressing. 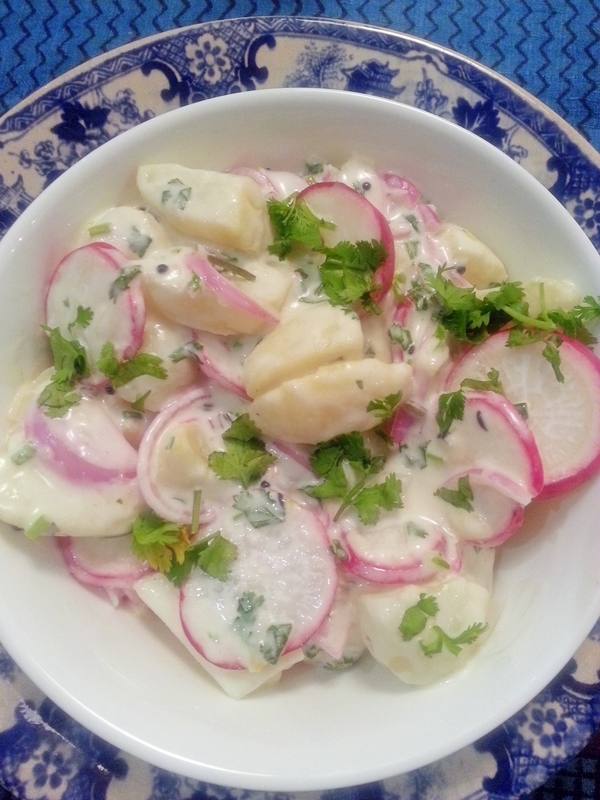 Stir in the sliced radishes just 5 minutes before serving the salad. Taste and adjust the seasoning sprinkle a bit of fresh coriander leaves on top. Lovely recipe… will definitely be making this! Lovely! Tried it and it turned out great.